The original library entrance; not enhanced by Toronto Hydro, Bell and Rogers! Just a little to the north of Shoppers Drug Mart at Weston and King is a gem of a building that sits quietly in its own regal splendour. This Arts and Crafts, Art Nouveau style building is almost 100 years old. In 1911, the Weston Library Board applied to the Carnegie Foundation in New York for a $10,000 grant for construction costs. The Board had changed from a subscription library to a public one in preparation for the grant. The Foundation approved the board’s plans and the village of Weston purchased a 140 x 60 foot site for $1950, agreeing to pay for books and library staff from tax revenues to the tune of $1000 annually (quite a burden for taxpayers). The librarian’s annual salary was $300 while the custodian was paid $60. Original hours of operation: Daily 3 – 5 pm, evenings 7 – 9 pm except Wednesdays. The Arts and Crafts, Art Nouveau style was popular at the time and Toronto architects, Lindsay and Brydon were selected to design the building. Their previous collaboration in designing small churches seems to have carried over to the library design as it has a chapel-like appearance with stained glass windows. The design was approved by the community and, common to all Ontario Carnegie libraries, incorporates mosaic lettering over the doorway. Detail of the original entrance showing the porch archway and mosaic. Andrew Carnegie (1835-1919) was a Scottish-American steel baron who became a philanthropist in his later years (think rich like Bill Gates). His story is a true rags to riches one and he credited some of his success to the availability of a library when he was a young man working twelve-hour days, six days a week as a telegraph clerk. He donated money through one of his foundations for 125 libraries in Canada, and about 2400 in the U.S. the U.K. and other English-speaking countries. The Weston Library is testament to his belief that libraries are a benefit to all of society and are a great tool to help people better themselves. He is famous for stating that the first third of a person’s life should be spent acquiring an education, the next third acquiring wealth and the last third giving away that wealth. Carnegie Libraries pioneered the idea of browsing and selection of books directly by patrons rather than by requesting a book from the librarian. Remember when the LCBO was like that? 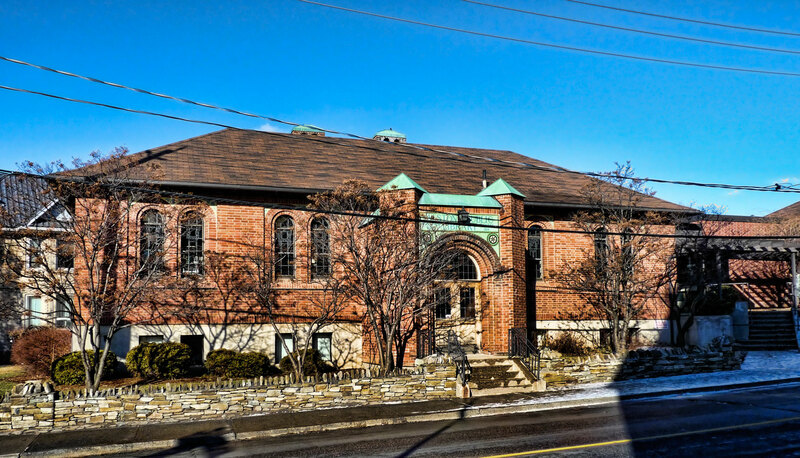 Weston Public Library is one of seven remaining Carnegie libraries still functioning in Toronto. It was declared a heritage building in 1979 after an attempt to have it replaced in 1975 (sound familiar?) and an addition, which tripled the floor space, was completed in 1982. 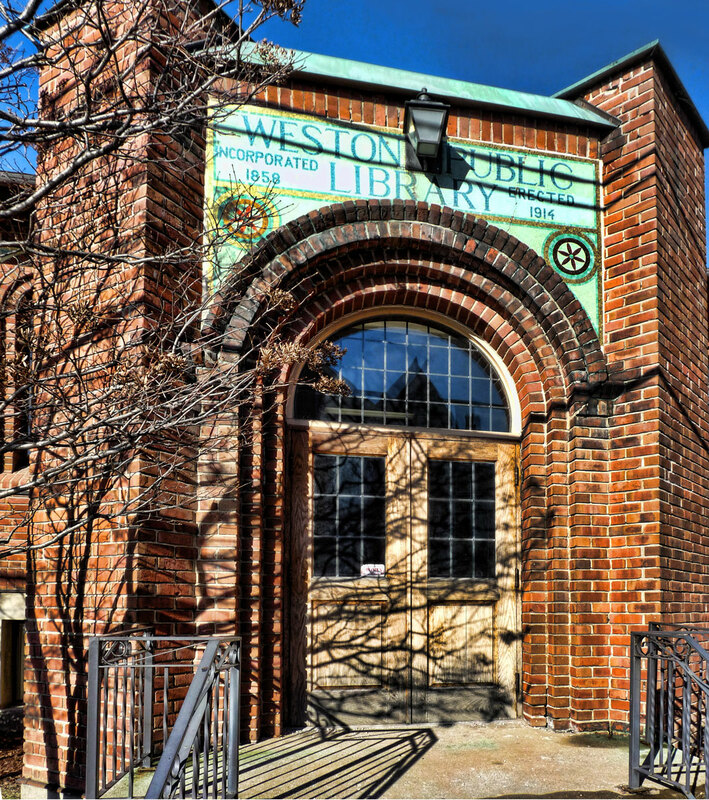 Incidentally the attempt to demolish the library sparked the founding of the Weston Historical Society. Next time you go to the Weston branch, be sure to check out the original stained glass windows. They are beautiful. Do you have a suggestion for coverage of another Weston treasure? Let us know through the comments section. that’s a nice piece on the WPL. i have a suggestion for another weston treasure, this one being industrial: the satin hardwood flooring site, consisting of the factory, tall masonry chimney & oak street office building. I remember using those front doors as a kid. Since they stopped using it many people don’t realize the beauty of the front of that building. For another suggestion of a Weston treasure: Weston Memorial Public School, Oddfellows Hall, The Masonic Lodge and the small Anglican church on Weston Road just south of Church. since fraternal organizations were mentioned, was this an elks building?